The highlighted item has black text over orange background, but I'm pretty sure should be white over orange. Also, scroll arrows (when the box reaches the top or bottom of the screen) are black over dark gray, barely visibles. I'm pretty sure this is not by design, and also could be an usability issue due to the lack of contrast. This is a real issue with theme, I am not sure if they had to do this becuase it breaks something else otherwise but please show it Andrew Cimi & and Makers of the GTK Theme. 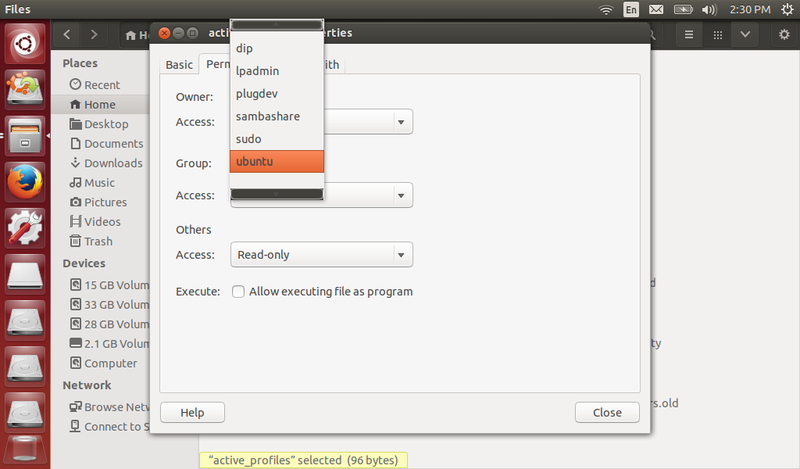 Any Dropdown box in GTK 3 , File Type, Options , Has Black text in the drop down menu.... See Picture. Thanks Jared for the confirmation. I've added the Ubuntu Theme team to the report, but could not find Andrew Cimi to subscribe him. I'm going to bring attention of the QA team over this, to see if someone can fix it before the release. Black combobox scrollers are already reported at LP: #1247105. Thanks Adolfo. I can see on the screenshots, that text highlight works as expected on 13.10. Confirmed that black-text highlight is something introduced on 14.4 and not related to other visual bugs as #1247105. Guys I am tottally bummed out, I found that this Black Text may be intentinol to fix a bug that will have the opessite effect. I read in the source code of the theme at Line 1037, It mentioned this is intentinol I Belive. This is what I sort of figured GTK Themes are so dang fickle in this respect, GTK 3 has the same issues as GTK2 Theme are messy matter. Well, that report is for 12.04, mainly GTK2. I think the problem is that the fix is not compatible with GTK3 (the attribute cascades into the new combos, or an explicit declaration is needed). If Settings are up to date with GTK3, perhaps the fix is no longer needed. Before doing anything, if you are currently using Ambiance and it is your active theme, please switch to another theme such as default Radiance. Right-click on your desktop & choose "Change Desktop Background" from the menu, then under "Theme" option use the combobox menu to select Radiance; close the window & now we can proceed. (2) Now go down to the "menuitem" style declarations at line 1018; scroll down a little further and you will see a style fix for lp:949368 identified as a workaround for earlier versions of Gnome. 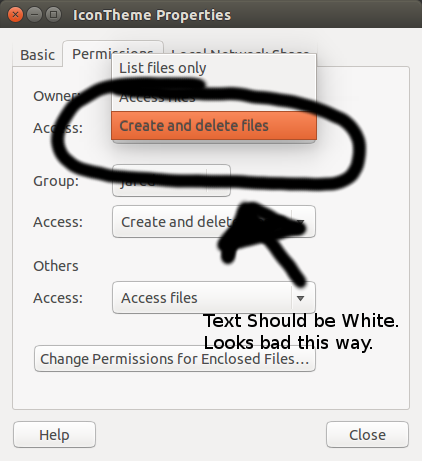 This fix is no longer needed with the default gnome 3.10 libraries included in Ubuntu 14.04; and in fact it is the cause of the problem. Simply comment out that workaround or delete it, it is your choice. Now save your changes, exit the application, and change your theme back to Ambiance to see the results. I suggest you open Calculator click on the "Degrees" combobox and go down to "currency" and a long menu will open with the proper scroll-arrow buttons to confirm. Thanks Dennis. I'll test your solution, but I think it worth the attention of the theme team for approval and merge.